Okay...for many years, I have boasted over my grandma's homemade apple pie recipe. And I'll still stand by it. However, I think the time has come for me to pave the way for the new Queen of Pies. To welcome the new ruler of that supreme dessert. That's right, folks, there's a new tart in town, and she's absolutely divine. There are a few places in Amsterdam that feature the best of the best traditional Dutch apple pies...tall with a sweet crumbley crust, with apples that are perfectly straddle the border between Sweetsville and Sour Town. Winkel, a small cafe conveniently next to the Noordemarkt (near our huis), has decidedly been our favorite. We've been known to consume said pies on more than a few occasions, meeting friends from all over Amsterdam who will come our way just to get a slice. Donna, the Pie Goddess, is in the second picture. Her humble pupils joined her in the last picture. 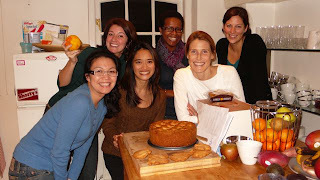 L to R: Christina, me, Aurelie, Donna, Jenn (the host), and Carly. What a fun night. What a great pie. 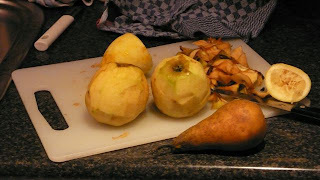 about 8 big apples (Goudreinet or Braeburn) also add 2 softer apples. Now if you like other ingredients, like nuts and raisins, add them to you apple mixture. Don't like raisins, but would like to try something else, try dried apricots. As with any recipe. You like it sweeter, add more sugar. But please don't use a margarine or any other low fat butter. Just use the real stuff. Mix butter and sugar together until soft. Sift the flower twice (separately) then add to butter and sugar mixture. Then mix together and let it rest. 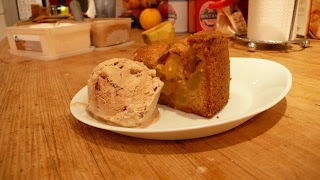 Peel your apples and mix with a scoop of sugar and a little bit of Calvados. Add the zest of 1 lemon and 1 orange. In a pan add a little butter and heat up your apples (and raisins etc.). The softer apples will start falling apart. Heat the apples only for a short 2 or 3 minutes. Meanwhile. Butter your cake dish and cover the bottom with baking paper. Then line the entire dish with your cake mixture. Safe plenty for the top. If you want you can add some brown sugar on the strips. You should still have some of the mixture left. Make different shapes of fruits or just apples and bake these separately. You will end up with some nice butter cookies that you can use to decorate your cake. I didnt knew you know Donna she is a great Lady. When you see her please give her my regards. Just wondering why the butter has to be a mix of salted and unsalted? 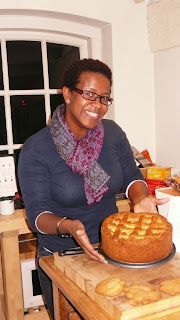 I am just home from Amsterdam and am so happy to have a recipe to replicate Winkel's apple pie/cake, but at what temperature and for how long should it baked? Bless you for posting this recipe! We have been looking for it since we went to Winkle 2 1/2 years ago. We tired many a variations but none fit the bill! Just been to Winkel and hunting on line for a recipe to replicate the deliciousness at home! Thanks so much for this. What kind of pie dish is best to use and as per the other comment, how long did you cook the pie for? You are a saint for sharing this with us! Like you I used to think I made the best apple pie in the world. That was untill daily trips to Winkel while in Amsterdam last month. That is the best in the world, ever! holiday around Europe and one of our stops in Amsterdam, and of course we had to go to Winkels and try their "to die for" apple tart. I myself love apple pie very much and in our restaurant in Torremolinos we prepare a very similar apple pie. The only thing we do not use eggs, eggs normally would result in hard dough.. This body of instruction is supported this professional industrial graph capabilities to the tremendoussuccess. This axiom is supported this expert industrial design capabilities to the remarkablesuccess. A fairly new innovation at the tables of bingo is bingo bags. They are cute little accessories that bingo players love to have their paraphernalia in, Such as good luck charms and an array of daubers. Constantly quite small, All the different bingo bags available can only be limited by imaginations. [url=http://www.boosbag.com/index.php]www.boosbag.com[/url] Many people assume that their homeowners or business revenue will cover them during an offsite party. Reliant on your policy, That are probably not the case. Additionally, When you are using vendors, Be sure to obtain a seek services. [url=http://www.burberrynj.com]Burberry bags[/url] Skin and Surgical TreatmentsSkin procedures such as cosmetic aesthetic laser treatments or chemical peels are primarily used to correct wrinkles, But they may have the added benefit of shrinking the skin, Thus improving ugly bags under the eyes. Eyelid process, Or greatly reduce lid blepharoplasty, Can provide a longerlasting remethod to fix eye bags and puffiness. It can also correct the wrinkling that develops from sagging eyelid skin. [url=http://www.burberrynj.com]burberry women bags[/url] Please call Tomtom for extra advice. Never store cigars near sunlight or for long periods exposed to sea breezes (Salt will not strengthen your smoke). The lower the local climate, The higher the humidity required to pay, The third main option for preserving your bridal dress is to bag it. As mentioned before, Some plastic garment bags produce discoloring. For and also other parts, You do not desire to use the drycleaner's garment bag.Then click the color boxThe Ed Hardy Setty N/S Shoulder Bag is one of most in-demand bags and is part of the Ed Hardy Handbag Collection. Greek keypattern quilt-making is somehow ultramodern when accented by patentlike trim, A new ta definitettooinspired a completeppliqu, And much much more shiny hardware. Also offers a zip closure, Rooms zipper pocket,Back zip wallet, Obvious trim and a link chain obvious handle.One can choose from an enormous variety of prints, Sizes and colors and tend to be very affordable. The rainbow bag in the photo is one I purchased from the seller LusciousLemon and I am extremely pleased with the quality and vibrant colors. Nevertheless the bags are often very wellmade, With any purchase involving small objects adult supervision needs to mitigate choking risk. Hello, everything is going nicely here and ofcourse every one is sharing data, that's in fact excellent, keep up writing. It's not my first time to go to see this website, i am browsing this web page dailly and get good data from here everyday. some nice practices and we are looking to exchange methods with other folks, be sure to shoot me an email if interested. visitors, to company websites in exchange for a commission for any sales your traffic generates. you want to make money online work from home business. specialists of this sector do not understand this. You should continue your writing. It is sold through Click - Bank, considered the internet's most trusted digital marketplace. What size of springform pan did you use? Esa-Pekka and LA Phil: Debussy's "La Mer"